The Norwalk juicer is the ‘Daddy’ of the juicing world, it’s well respected and commonly known as the best in the business. It has a unique juicing process that can’t be found on any other juicer. Here is my Norwalk juicer review. 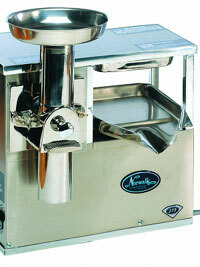 The Norwalk is based around a two stage juicing process. The fruit and vegetables are first grinded into a muslin bag. That bag is then placed onto a press where the extraction of juice occurs. The juice is literally squeezed out. The Norwalk company have carried out various research proving that there is no other juicing machine that can produce such a high quantity of juice which contains such a large amount of nutrients and minerals. The Norwalk juicing machine is really aimed at the serious juicer, it’s not the quickest, possibly not the easiest to clean however it does produce the largest quantity of quality juice. For people looking to use juicing as a way of fighting or recovering from diseases such as cancer then the Norwalk juicer comes highly recommended. The Gerson Institute in San Diego in America use only natural remedies to cure cancer. At the heart of their program is juicing fresh organic fruit and vegetables to help the body fight the disease. They recommend the Norwalk as the best for cancer juicing. All of the parts are manufactured in stainless steel and come with a whopping 12-year guarantee that shows you how confident they are about their product. I also like the fact that you can produce juice and store it in air sealed containers in the refrigerator for up to 3 days. This is because the juicing process is so gently and doesn’t add too much air to the juice, so that when it’s stored the juice keeps its colour and valuable nutrients. The only down side to the Norwalk juicer is that because it’s the best it comes with a hefty price tag of around $2000.00. So it certainly isn’t for everyone. I would however seriously recommend this juicer if you had a serious health problem or were fighting a disease like cancer. After all an investment in your health is priceless. Please take the time to watch this video produced by Norwalk as it explains the juicing process far easier than I could and it really is quite a unique way of juicing. I was amazed at how little waste (pulp) was left in the bag as my masticating juicer produces far more pulp.